Houston, we have problems! Meteors incoming! The llama armageddon (llamagedón in short) is coming and llamas are afraid of it. To brace themselves for the end of the world, they need to build shelters. 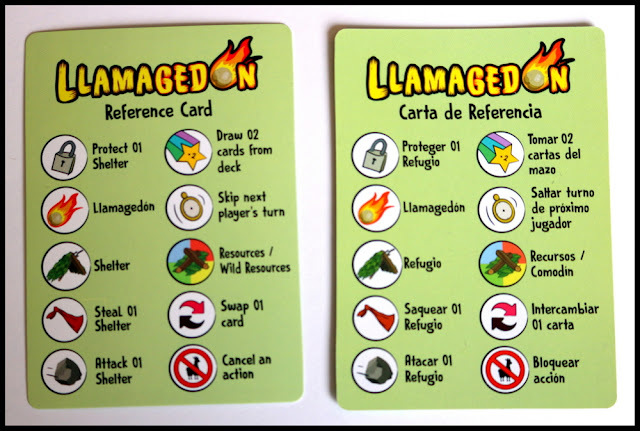 Llamagedón is a slightly strategic and light card game that combines mechanics such as hand management, take that, and set collection. On their turn, a player draws a card from the deck. If they draw a Shelter card, then they have to play it immediately by placing it down. Shelters can also be built by combining resources. Beside playing shelters or building them, a player can use one action card which might involve attacking or stealing shelters, swapping one card for another, skipping the next player's turn, protecting your shelter, drawing two cards from the deck or even canceling the action of another player. Eventually, a player will draw the Llamagedón card from the deck (which was randomly shuffled into the lower half of the deck) and this means everyone gets another two turns. After that, whoever has the most shelters is the winner. 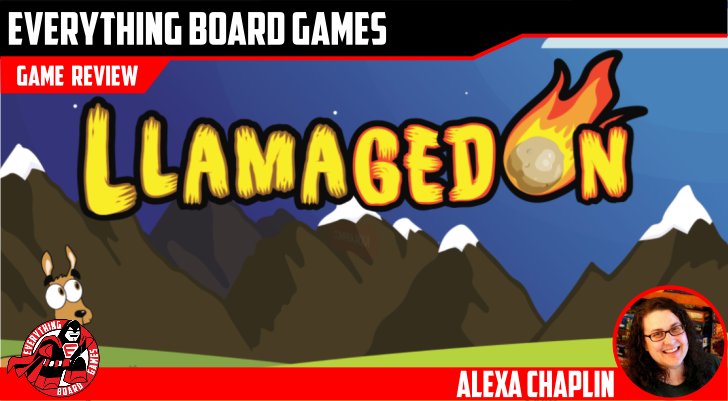 If you like llamas, meteors and sheeps, then Llamagedón might be a good fit for you. Llamagedón sets the players up as llamas trying to save themselves from the inevitable pummeling of a giant meteor shower. You'll need to channel your silly side as you build, attack, swap, and steal shelters as a herd of llamas. The charmingly light-hearted theme permeates the game from the artwork and gameplay to the bilingual instruction booklet. Llamagedón contains a deck of 60 glossy cards, five player reference cards, and an instruction book all in a sturdy box. 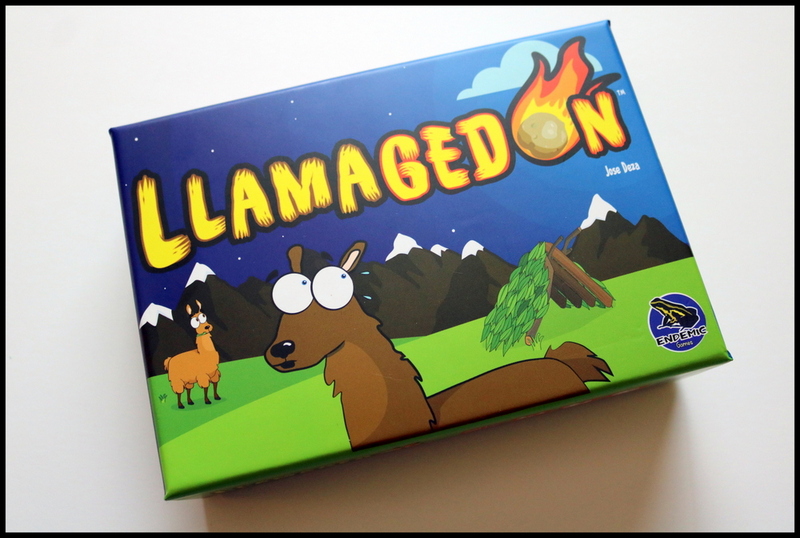 The cartoon llamas with their big eyes and expressive ears and eyebrows made us smile from the moment the game arrived! Setup is simple, and involves shuffling the deck, dealing each player four cards, and then inserting the special Llamagedón card randomly into the bottom half of the deck. 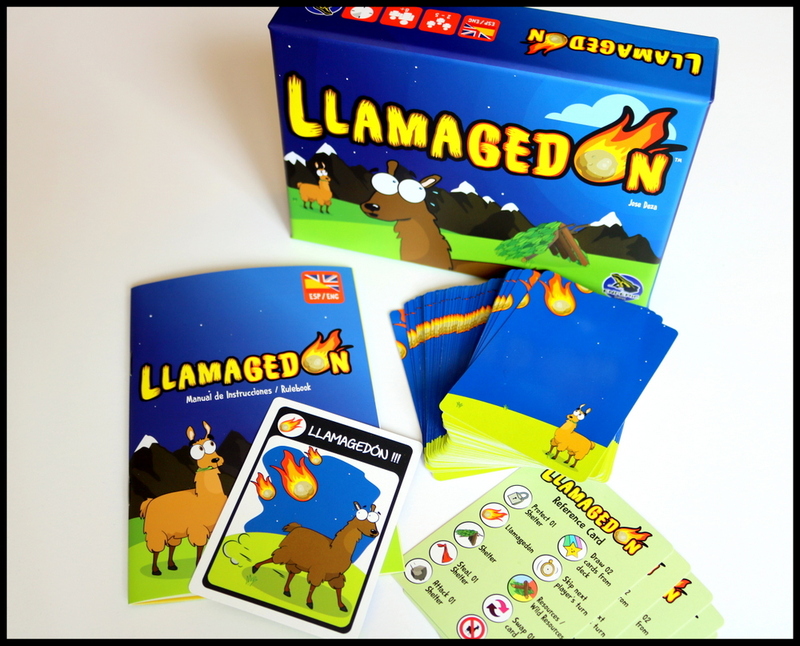 Llamagedón is a hand management and set collection game, with some take-that elements. 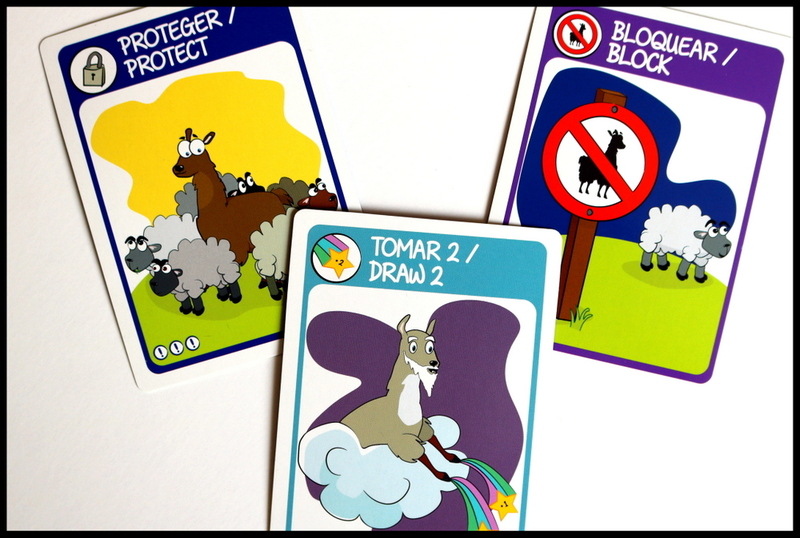 Each player draws a card and then plays a card in the hopes of collecting more shelters by the end of the game than any other llama. Start with a hand of four cards, and draw a card to begin your turn. Whole shelters (dark blue cards) are played in front of you immediately upon drawing them. 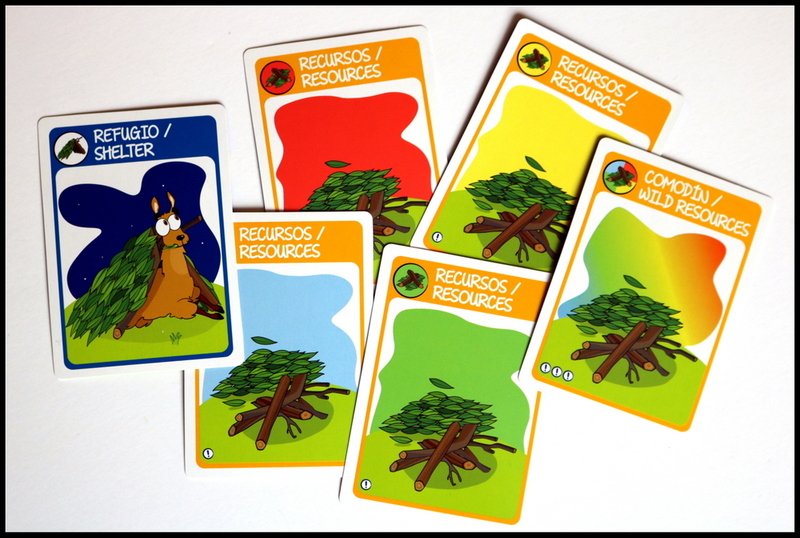 To build more shelters, you'll need to collect orange-bordered resource cards in pairs of red, yellow, blue, or green. Wild cards can help you build shelters faster. Aggressive action cards include Swap (trade one of your shelters for one of an opponent's), Steal (a shelter from an opponent), Attack (discard an opponent's shelter), and Skip (the next player's turn). Defensive cards include Draw Two (more cards), Protect (a single shelter from any aggression) and Block (the action card headed your way). The round-the-table game play felt familiar to my kids (who were raised on games like Fluxx). We needed only a minute or two to teach this game and then we jumped into it with grins and sabotage on our little llama brains! 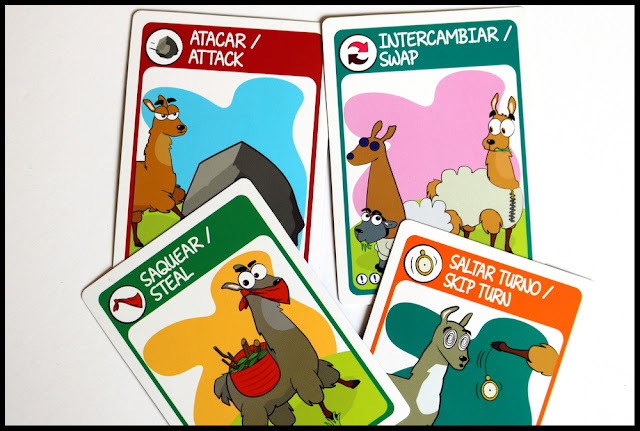 When the dreaded Llamagedón card is drawn, each player will have two more turns to add any shelters or take actions against your opponents in order to try to come out on top as the llama with the best collection of shelters! I love that Llamagedón, originally created and published in Peru, remains bilingual. For families who are working on adding a second language - Spanish or English - it's a great little feature. You can pick the first player however it suits you, but it is suggested that the player that makes the best imitation of a llama begins. If a llama imitation is too hard, then imitating another South American camelid or even a sheep is acceptable. I love games with humor that permeates the rules! Even a sheep is acceptable. 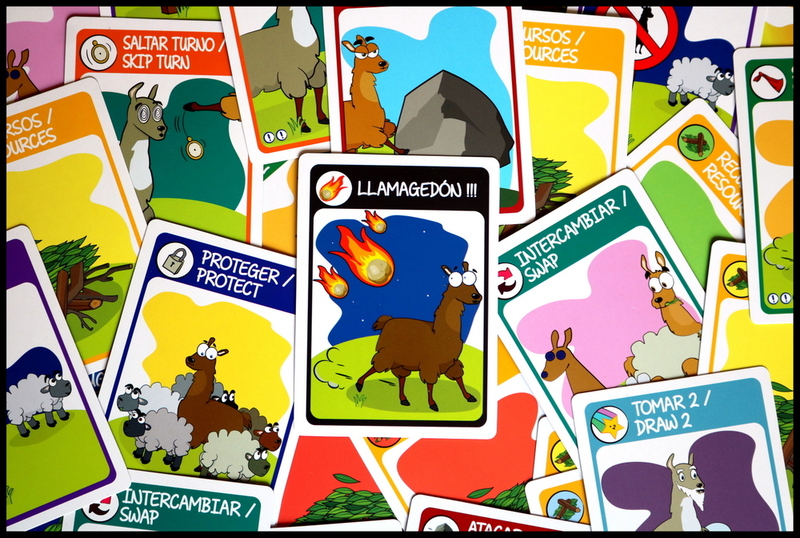 We all enjoyed the easy-to-learn gameplay of Llamagedón as well as the sweetly goofy artwork. My kids laughed every time they drew a new type of llama card. This game was perfect for my 11-year-old daughter, but my 15-year-old son found it just a little too light for his tastes. It's all about what you're looking for in the experience of a game! Llamagedón is definitely a lighter experience, so keep that in mind. 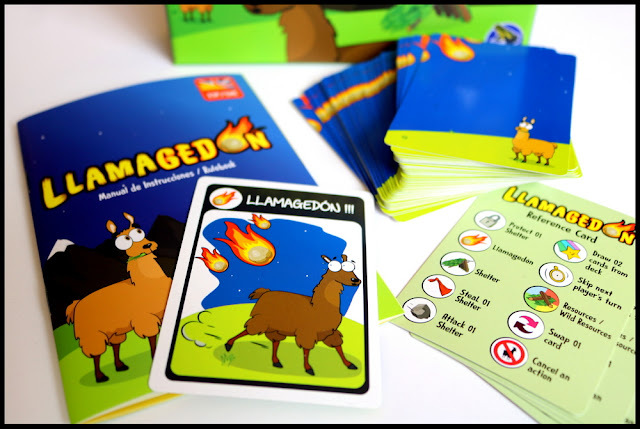 Players who enjoy light, humorous card games like Fluxx, Bahoochie, Exploding Kittens, or Just Desserts may enjoy Llamagedón. Overall, Llamagedón is a good fit for our family. 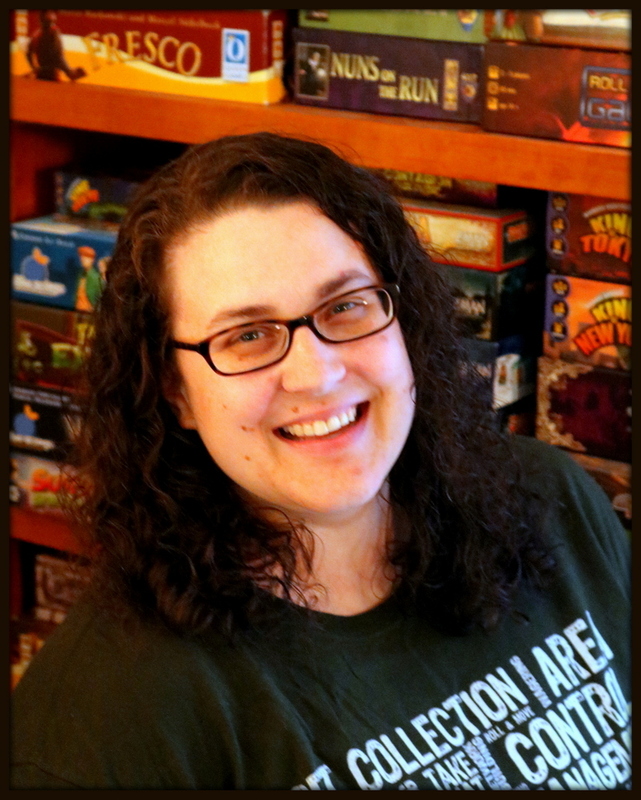 Its quick play-time and family-friendly artwork will earn it a place in our family's go-to bag for games-on-the-go!